I squeezed in a tenth cooking class during the morning of our last full day in Florence. It felt appropriate to go back to Giglio Cooking to learn a little more from Marcella before heading home. 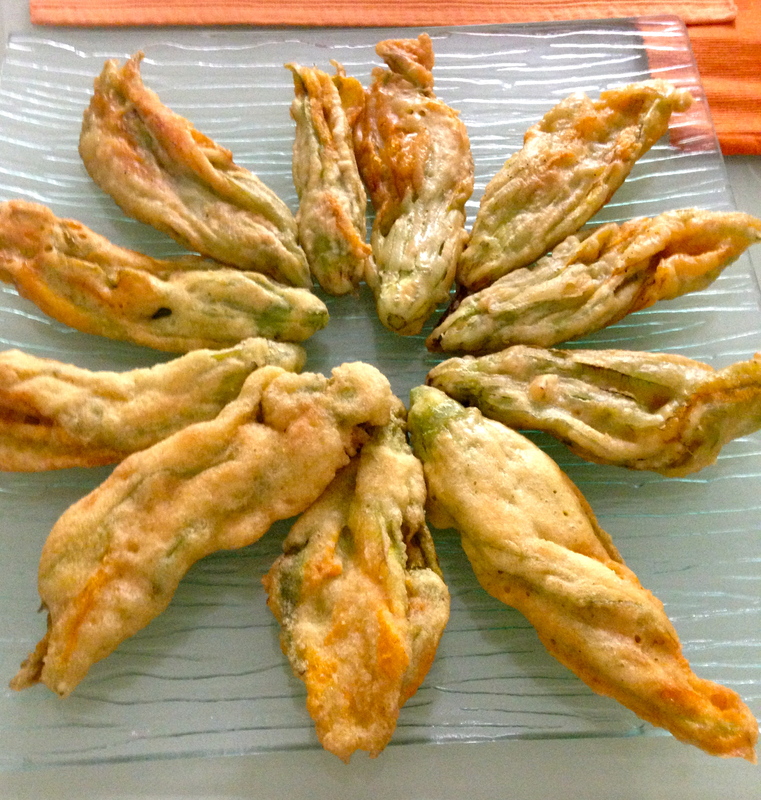 The focus of today’s class was vegetables and we started out with one of my new favorites – fiore di zucchini friti (fried zucchini flowers)! These turned out so wonderfully. They were crispy and decadent but still light and fresh. I never had stuffed zucchini flowers here in Italy, but I think a just a touch of a ricotta, goat cheese and herb filling would be absolutely incredible. Next we made a couple of dips. Marcella commented that dips are not at all an Italian thing to eat. 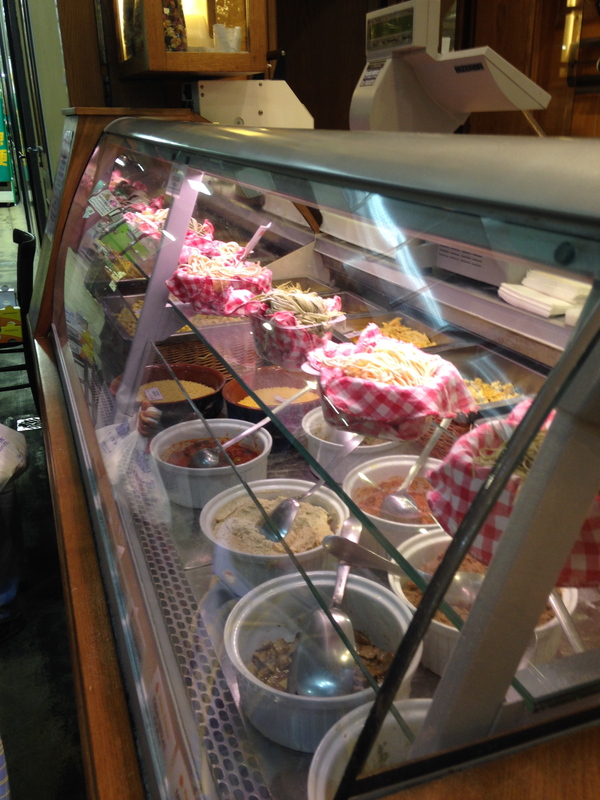 But with the increasing popularity of aperitivo buffets at bars where they provide such a huge spread of food, dips are slowly starting to catch on in Italy. So she came up with two recipes highlighting vegetables. 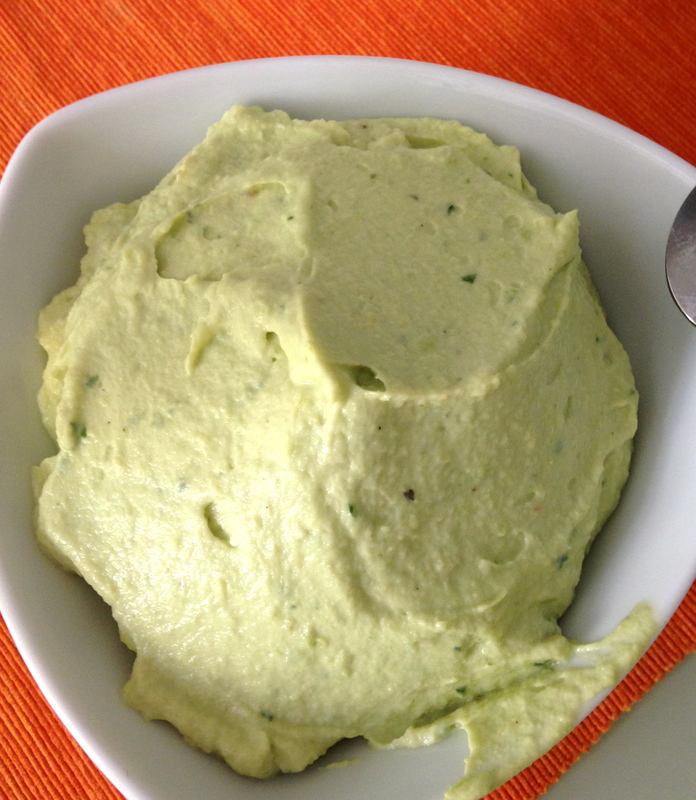 First, we made salsa di avocado which was like an Italian guacamole. The ingredients were just avocado, garlic, ricotta and yogurt seasoned with salt, pepper, and tobasco. It was so creamy and delicious, but full of nutrition as well! 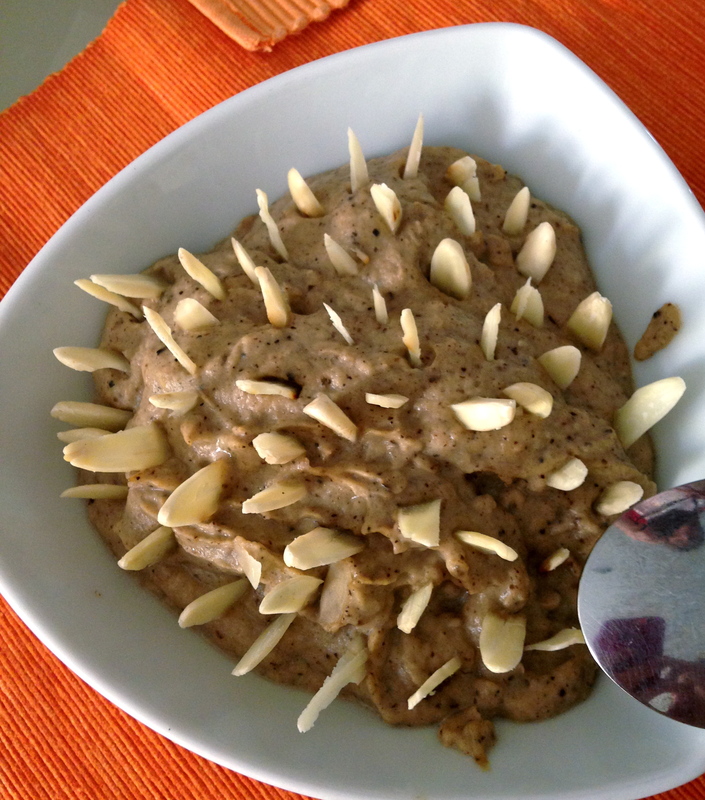 Next we made crema di melanzana which was an eggplant dip, like an Italian baba ganoush. This one was even simpler than the avocado dip. The ingredients were just eggplant (which we roasted, removed the skin and pureed), garlic, olive oil and a touch of mint. Mint never sounds great to me in savory recipes, but when I finally try them they are always delicious. And this recipe was no exception. Next we made two pasta dishes. 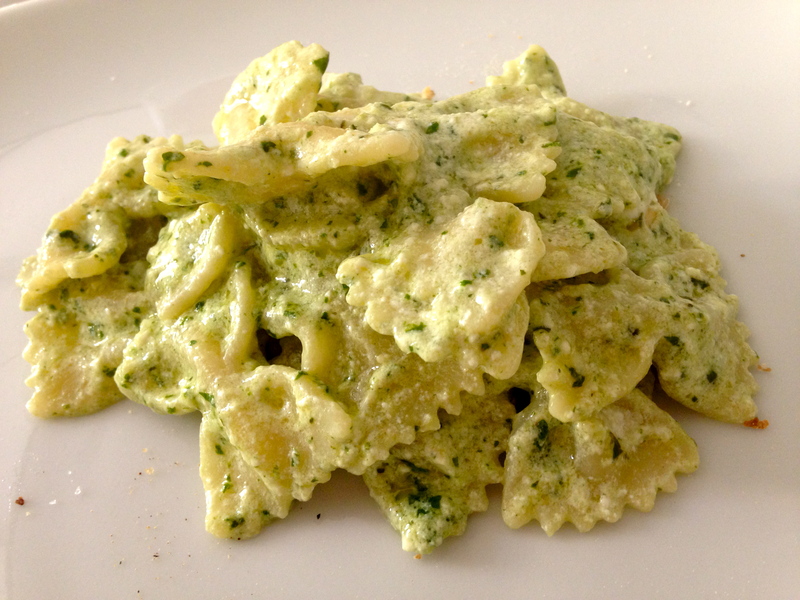 The first was farfalle con pesto e ricotta. Marcella called this a pasta per bambinas, or pasta for babies. This can be made with any shape pasta and the sauce is simply ricotta cheese that is slightly thinned with some pasta water and combined with any vegetable of choice. For this class, we decided we wanted to try it with pesto, so we picked basil out of Marcella’s garden and made pesto. Her tip for great pesto using a blender was to start by making a paste with the garlic, pine nuts, olive oil and parmegiano reggiano cheese. The key is to not pick the basil until the paste is made because the basil starts oxidizing the moment it is picked. So you will get a brighter green color if you wait to pick the basil until the moment you need it. We then simply added the basil, a little more olive oil to the consistency we wanted and blended it just enough to combine the ingredients. It was beautiful! And combining the pesto with the ricotta mixture made the flavor a bit milder and creamier. It was really delicious. The next pasta dish we made seems extremely simple, but is actually very difficult to execute correctly. The dish was spaghetti aglio e olio, or spaghetti with garlic and olive oil. The trick is to not overcook the garlic or the pasta. Timing is everything with this dish. You start by boiling the spaghetti and when almost done, you heat chopped garlic and chili flakes in a generous amount of a high quality extra virgin olive oil. Drain the pasta and once the garlic is floating in the oil (but not browned), toss in a large bowl with the pasta. 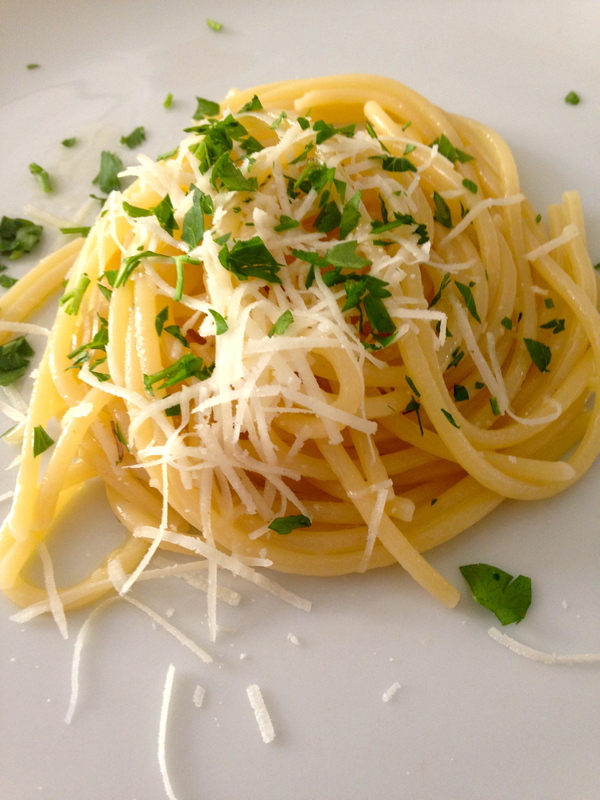 Top with chopped parsley and grated pecorino romano cheese. This dish is so simple, yet so incredible! The last dish we made was a real show-stopper. 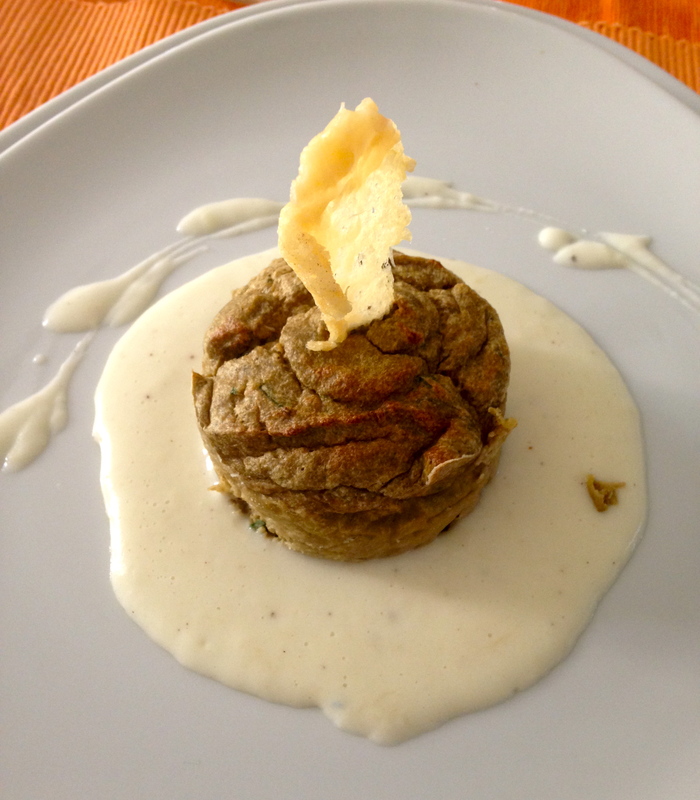 It was a tortino di carciofi, or artichoke tortino. There’s no real english translation for tortino. It is somewhere between a souffle and a flan. We cleaned, cooked and pureed several artichokes and a few porcini mushrooms with garlic and parsley. This is then mixed with parmigiano reggiano cheese and egg yolks. Whipped egg whites are then folded in and the tortinos are baked in ramekins sitting in a water bath. We served these over a mornay sauce made with butter, flour, milk and shredded cheese (we used a combination of fresh pecorino and parmigiano-reggiano). It was then garnished with a parmegiano-reggiano chip. This dish was rich, decadent and delicious! 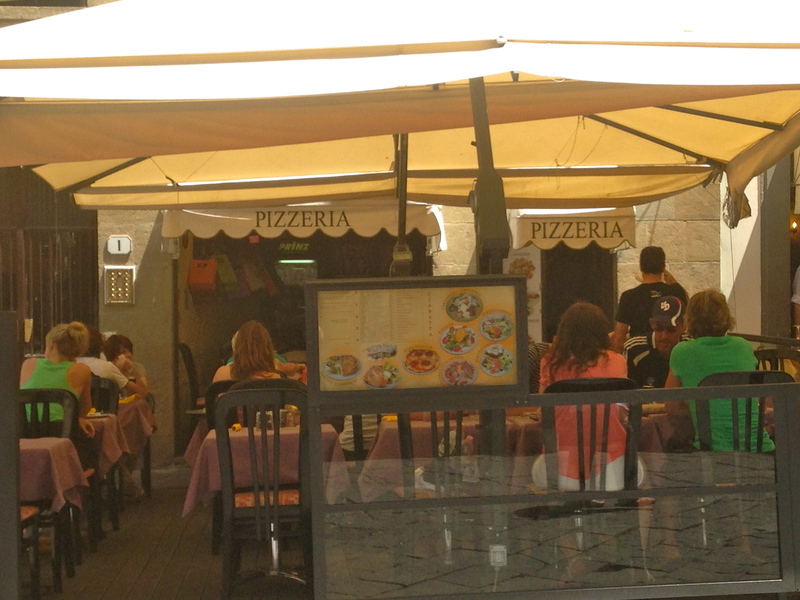 Although I wasn’t terribly hungry for dinner after my multi-course lunch, Joe had the great idea to eat at the pizzeria La Delizie for our last meal in Florence and order the exact dishes we ordered for our first meal (see Florence: Day 1). We paired the porcini mushroom soup and tomato and sausage pizza with a small bottle of Chianti and again, the food was delicious. It was the perfect ending to our trip! Our time spent in Italy was so incredible, it is hard to put into words. Unfortunately Emily won’t remember the experience, but Joe and I will never forget it. And I’m so thankful for the technology available to us today so that we have so many ways to capture the experience and share with Emily again when she is older. Viva Italia! 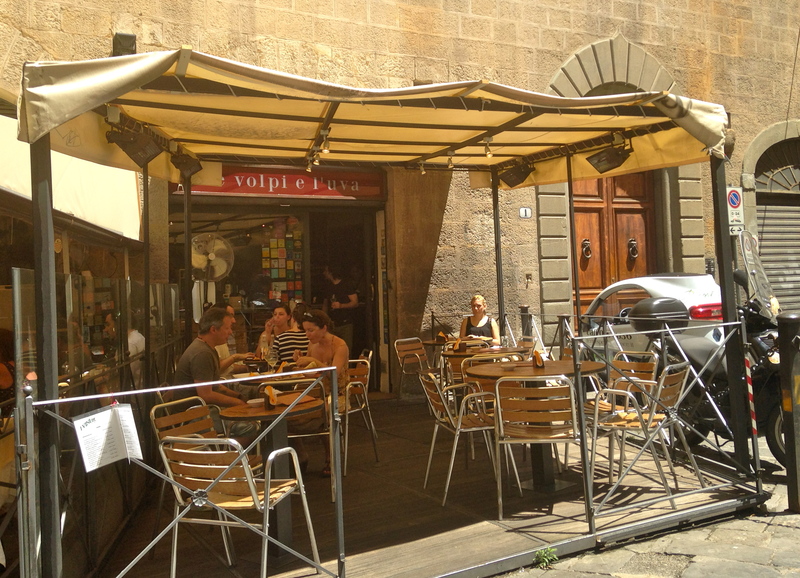 Today we continued our farewell tour to our favorite places in Florence. 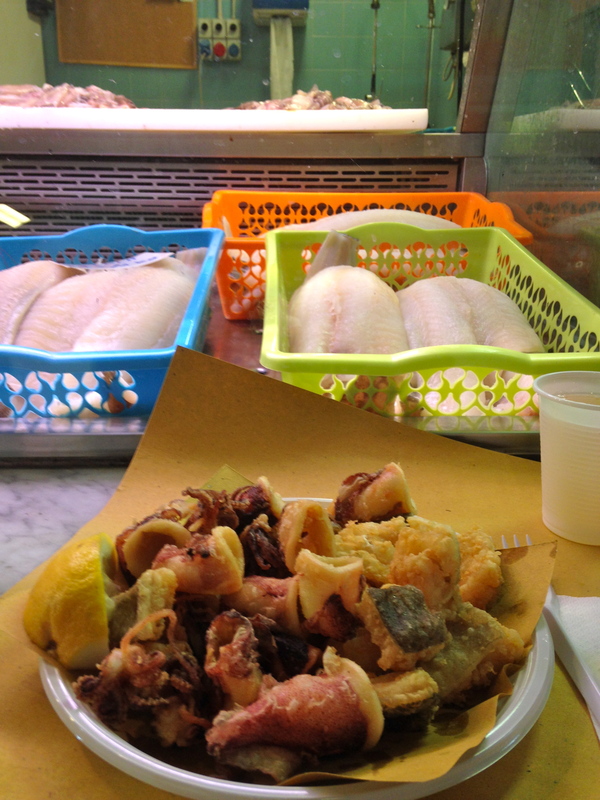 First, we went to the seafood stand in the Mercato Centrale for a plate of fried cod and calamari with white wine. It was incredible as always! Note: wine costs the same as water and less than Coke! 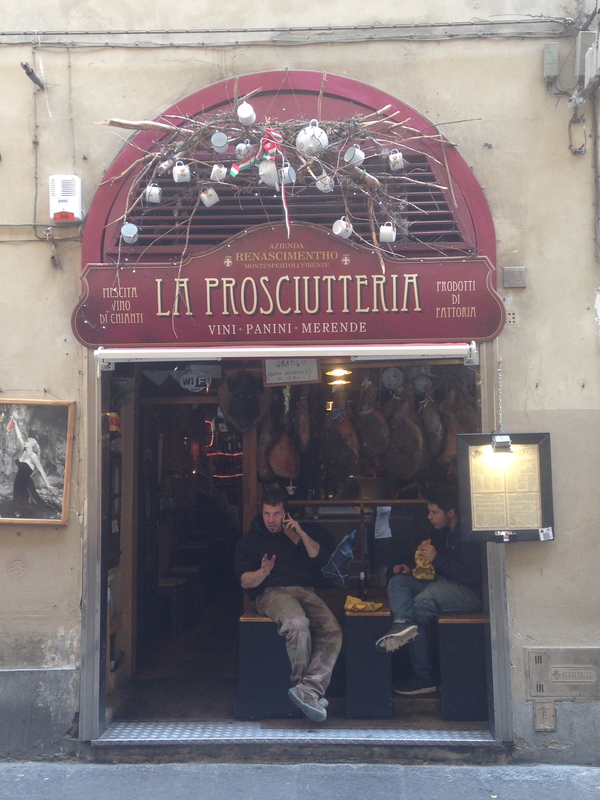 Later in the afternoon, we made our last visit to La Prosciutteria. The people working there recognized Emily and gave her a huge bowl of melon to eat while Joe & I enjoyed an antipasto board. We will miss this place dearly! Lastly for dinner, I wanted to use up the rest of my homemade marinara. 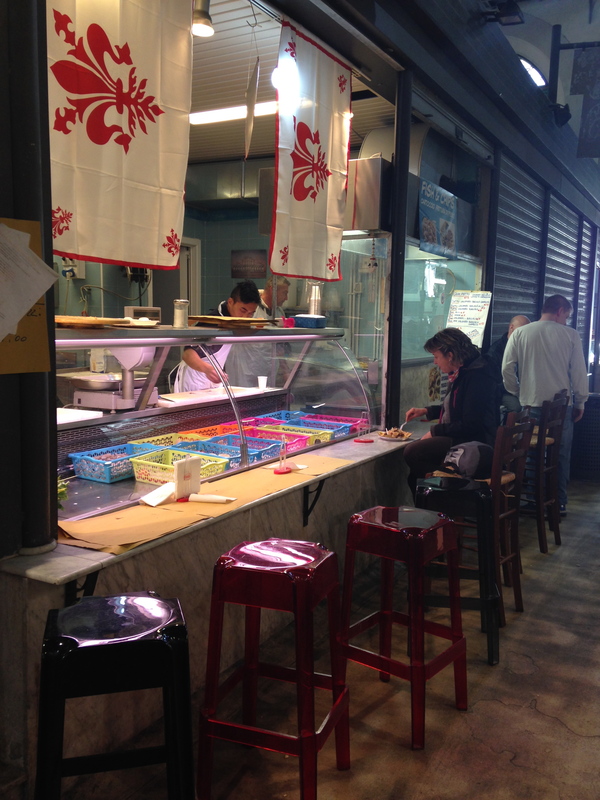 It was the perfect excuse to visit the fresh pasta counter in the Mercato Centrale. 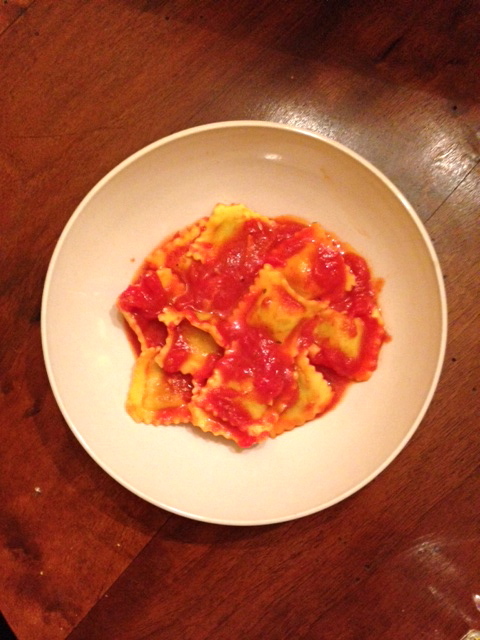 We chose basil ravioli which were filled with a ricotta-basil mixture. They were delicious and went perfectly with the marinara! We have officially begun our farewell tour of Florence. With only a few days left, we are trying to savor everything we love and will miss about this city. For lunch today, I cooked at home with some ingredients that are not easy to find back in the states. I made trofie pasta (tied with bucatini as my favorite pasta shape) with zucchini, porcini mushrooms, and truffles. 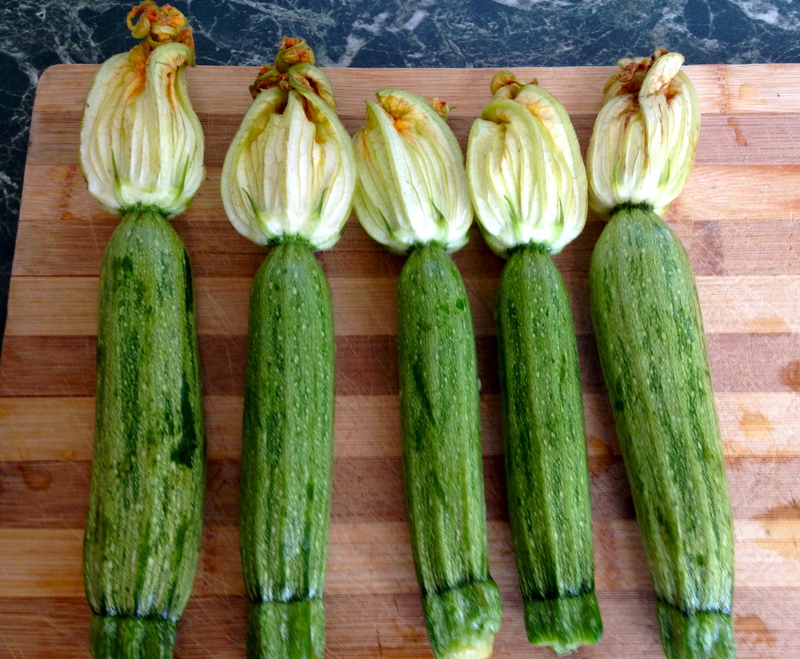 I bought some beautiful zucchini with flowers attached from the supermarket. I’ve only had luck finding zucchini flowers at some farmers markets in the states, but they are hard to come by and are often very small. Dried porcini mushrooms are possible to find in the US, but are generally quite expensive. The same goes for truffles. So to make the pasta, I simply chopped the zucchini and sauteed it in olive oil. I soaked the dried porcini mushrooms in warm water until soft and then chopped them and added them to the pan, reserving some of the liquid. I then added the cooked pasta, truffles, a splash of milk, a splash of the porcini mushroom broth and salt and pepper to taste. I lightly dusted the zucchini flowers in flour and shallow-fried them in olive oil in a saute pan until crisp and served them as a garnish. 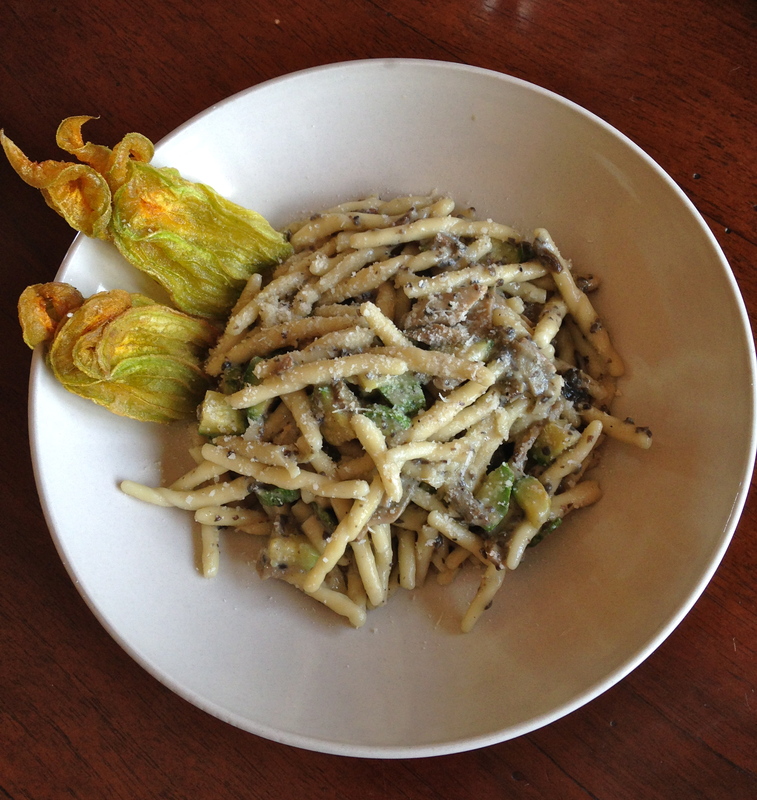 It was really quite easy to prepare and highlighted four of my Italian favorites: trofie pasta, porcini mushrooms, truffles and zucchini flowers! 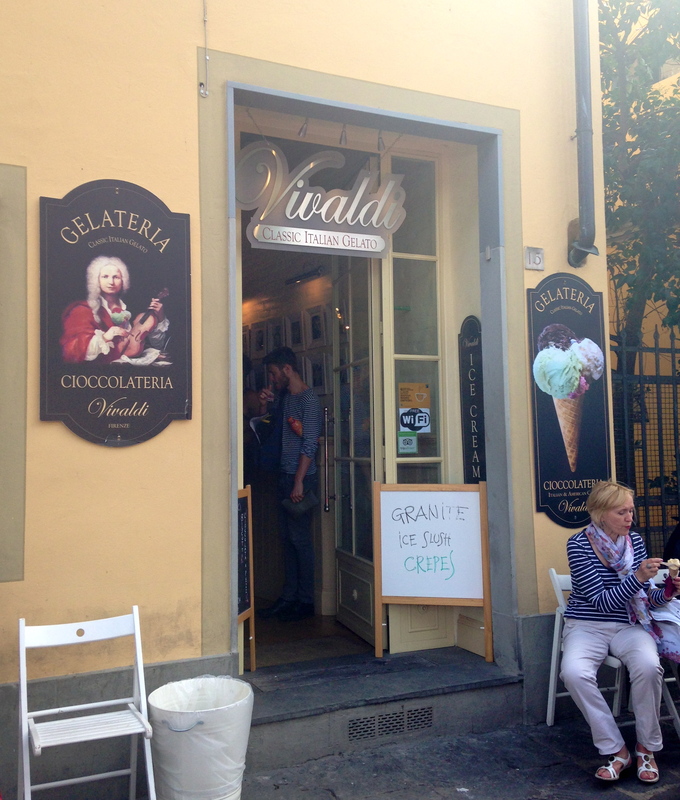 We went for a very long walk in the afternoon and found ourselves near my official favorite gelateria, Vivaldi. And this time, they not only were serving gelato, they were serving granita! 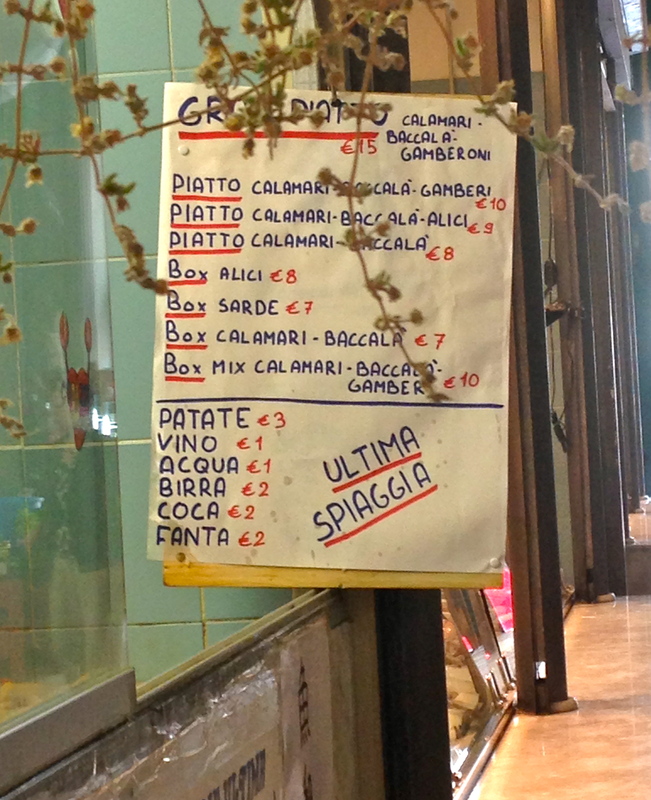 I had wanted to try granita in Italy, but everywhere I had seen it, it didn’t look very appetizing. I had only noticed it at touristy-looking cafes where it was being churned in a machine like a slurpee. I had actually made a comment to Joe days prior that I wouldn’t try granita from a place like that, but if a place like Vivaldi was serving granita, I would try it. So I was excited to see they had it! We ordered a gelato that was a mix of pistachio and chocolate chip with pieces of candied orange, and a watermelon granita. 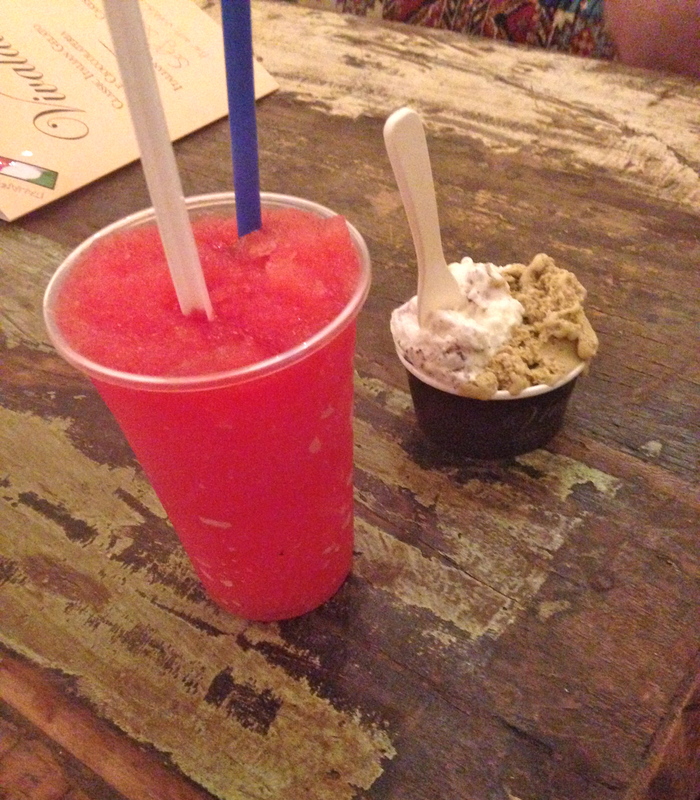 Both were so delicious and the granita was so refreshing! Although it was certainly sweetened, the granita tasted just like watermelon, not like sugar. The last stop of the farewell tour for today was La Volpe e L’Uva. We ordered our two favorites: the caprese salad and the truffle sausage and asiago crostone. We sure will miss this place! Today was Joe’s birthday and father’s day. Joe went out at midnight the night before to watch the Italy World Cup game and was also heading out at 5:00pm to watch another local sporting event, so it was a lower-key day from a food perspective. 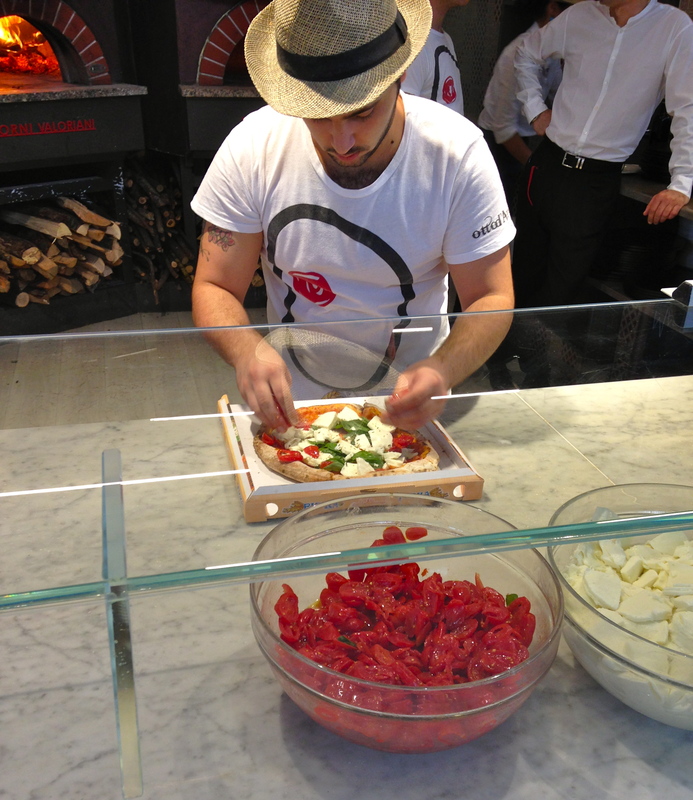 The one thing we did do was get a pizza da asporta (to go) from the Mercato Centrale. 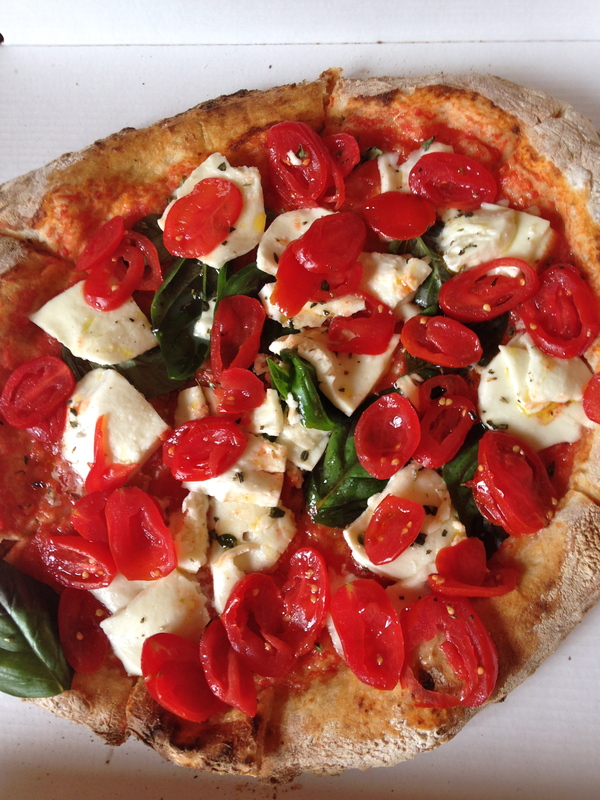 We ordered the Capri which was topped like a Caprese salad with buffalo mozzarella, fresh tomatoes and basil. We took the pizza home and ate it while Emily napped. The ingredients used were all so colorful, fresh and delicious. And the crust was thin but chewy with a slight smokey flavor from the pizza oven. This pizza was incredible! Today began the weekend celebration of Father’s Day and Joe’s Birthday, so we started by enjoying our last lunch out at a new restaurant. 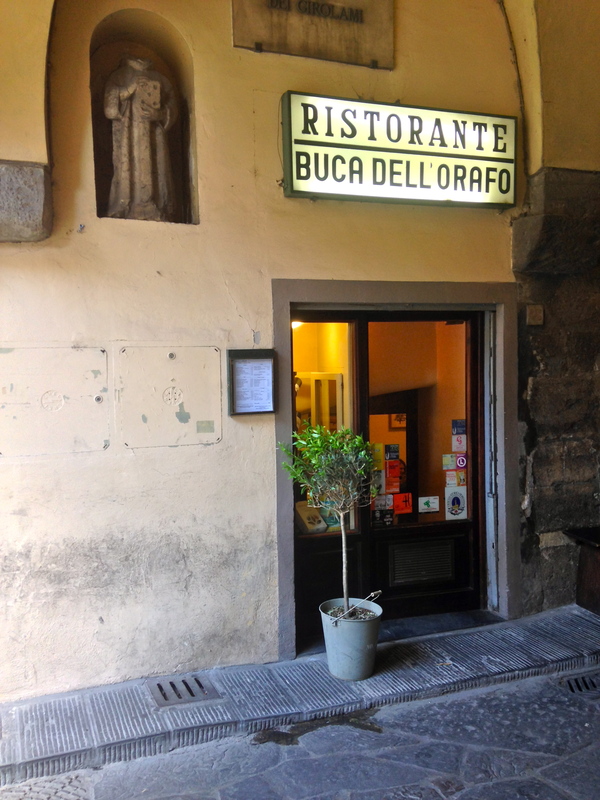 Buca dell’Orafo was recommended on Giada De Laurentiis’ website with a rave review, also mentioning the chef in the kitchen was an American girl in her twenties (http://www.giadadelaurentiis.com/giada/faves/9/florence). I was intrigued by the chef and figured this sounded promising for a great birthday/father’s day meal! 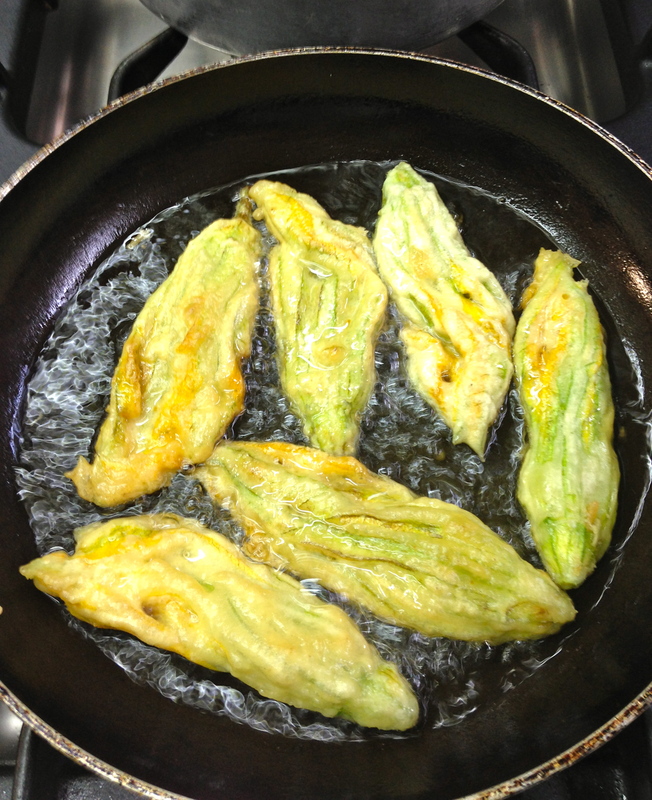 We started with the fritto di fiore di zucca e zucchini, or fried zucchini and squash blossoms. 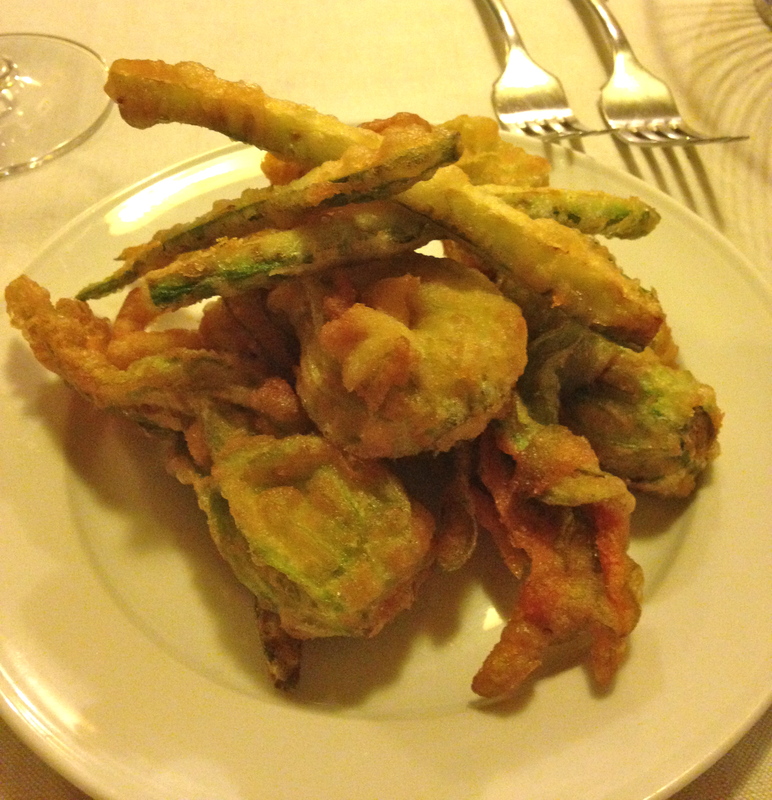 I love the fried vegetables in Italy. They are such a treat! These were exceptional. 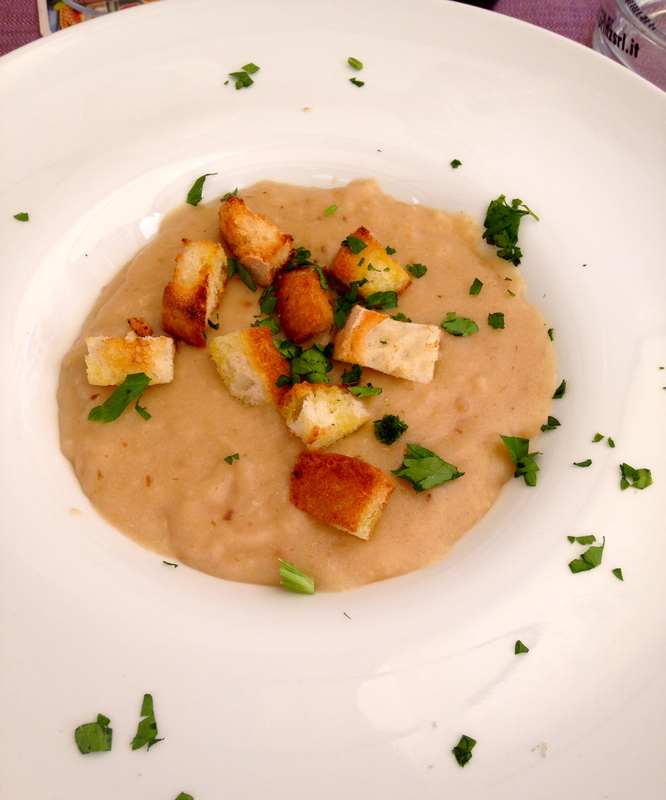 Next we split the pasta e fagioli, which is a traditional Tuscan bean soup. It seems the consistency of this soup varies from restaurant to restaurant and household to household. This variation was completely smooth with the exception of the pasta. It wasn’t what I was expecting at all, but it was smooth, creamy and comforting! Lastly, Joe was in the mood for a meat sauce, so we ordered the pappardelle al sugo di coniglio, or pappardelle pasta with a rabbit sauce. The texture of the pasta was perfect. And the sauce was hearty, but also tasted of fresh herbs, primarily sage. I don’t find many dishes more comforting than pasta with a meat sauce. This was so good! As we are nearing the end of our time in Florence, I had a few things in the freezer at home that needed to get eaten. Specifically, I had some meatballs and marinara sauce. 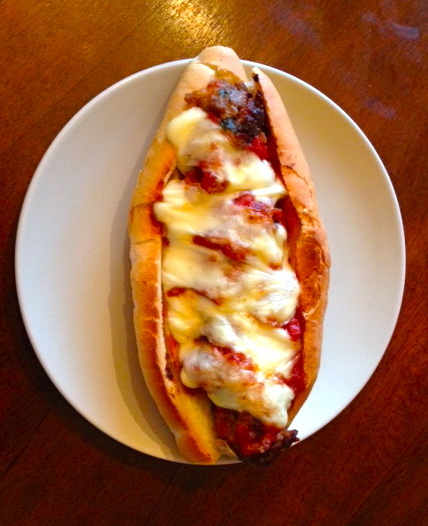 Joe loves meatball subs, so it worked out perfectly to make him a favorite at home for dinner. I just picked up a couple rolls from a local bakery, cooked the meatballs, assembled the sandwiches topping with some fontina cheese and baked in the oven until warm and the cheese melted and started browning. Joe said it was one of the best meatball subs he has had in his life, which is the best compliment I could hope for! Today I took my ninth cooking class. 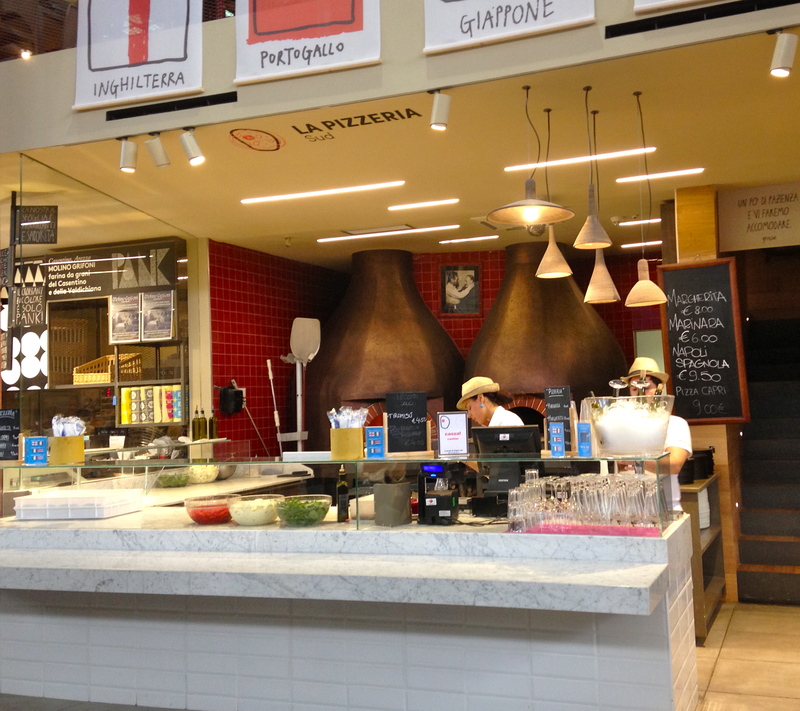 A beautiful cooking facility opened in the new upstairs portion of the Mercato Centrale since we have been here. 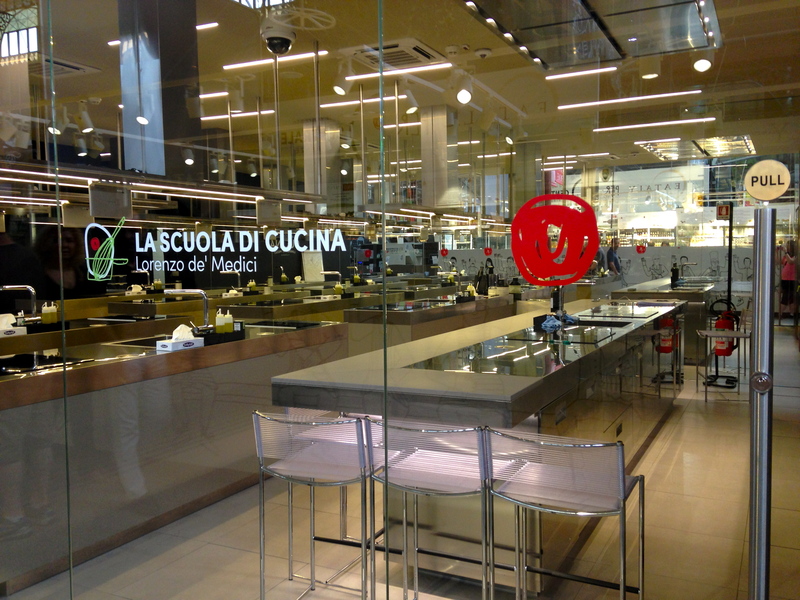 It is an extension of La Scuola di Cucina Lorenzo de’ Medici, which is a culinary school in Florence. I am so excited I got to take a class here. The facility was absolutely gorgeous! 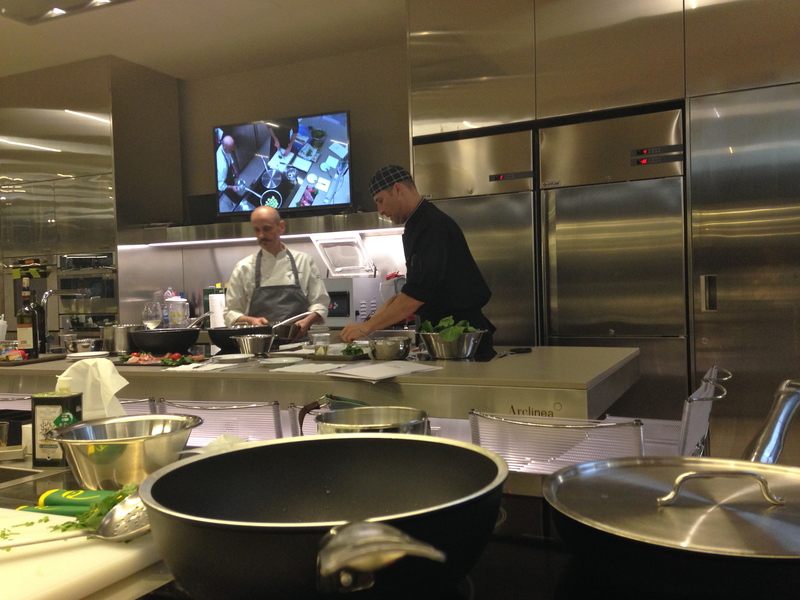 In addition to the beautiful, high-tech facility, the two other people that were signed up to take the class didn’t show up, so I ended up getting a private lesson from a chef/sommelier and a sous chef! 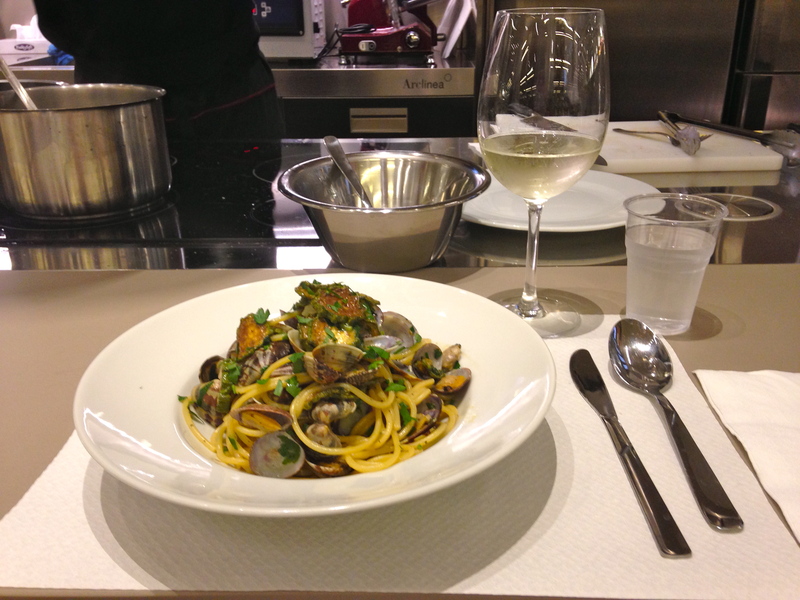 The class was l`arte di abbinare il vino al cibo, or the art of pairing wine with food. Wine pairing is something I have never learned much about. I know generally how to pair wine with food, but can’t claim to have created masterful pairings in the past or understand why wines sometimes pair well and other times do not. 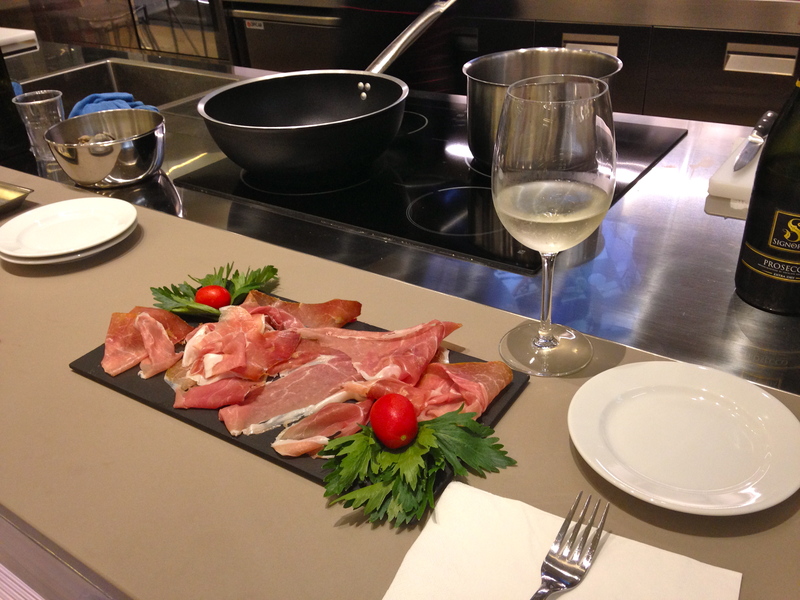 To start, we simply tasted a prosciutto toscano paired with prosecco. So right away on the first thing we tried I learned something because I would have never thought prosecco would be a great pairing with prosciutto. Chef Gennaro Napolitano who taught the course is also a sommelier, so it was so fun talking to him about the process of tasting the food and the wine. This pairing of food worked for a couple reasons. First, the strength of smell of the prosciutto matched the strength of smell of the prosecco. If you have a very strong smelling dish of food, you want a strong smelling wine to match, otherwise the flavor of the wine will get lost (since smelling plays a large part in tasting). Second, the acidity of the prosecco balanced the richness of the meat. We first just tasted the prosciutto. Not only did I taste salt and a bit of spice, my mouth was coated with the richness from the fat and it dried my mouth a bit (I’ve never put that much thought into eating prosciutto before). The prosecco’s acidity helped create saliva, offsetting that richness. To prove the point, he had me take a bite of prosciutto and while still chewing, add a sip of the prosecco. It was incredible how the two neutralized each other while still producing a pleasant flavor. 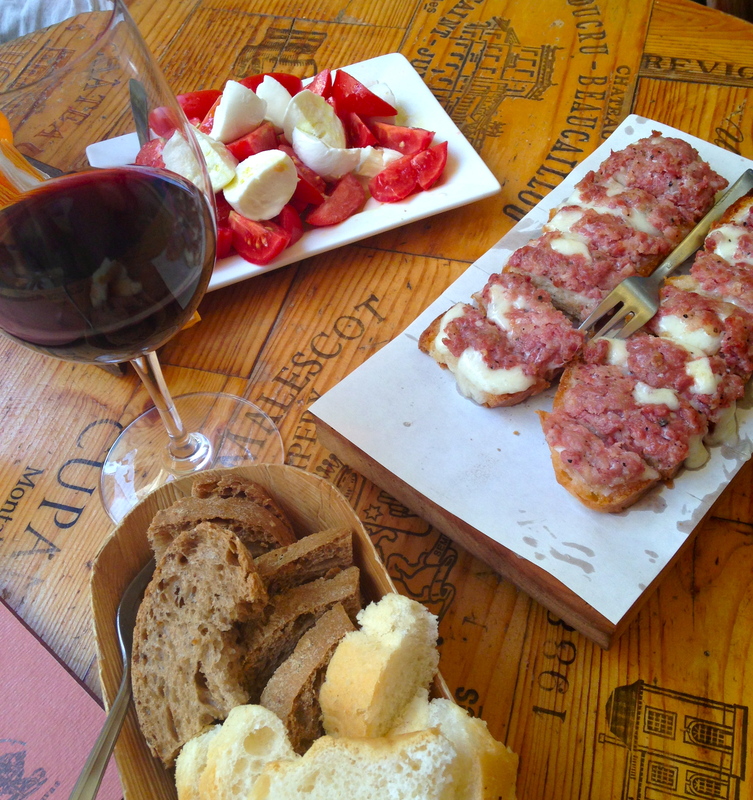 This was the perfect start to understand the basics of wine-pairing. Next, we started cooking. We made spaghetti with clams and zucchini in a white wine sauce. I am so excited to have learned this recipe because I plan to modify it slightly to recreate the delicious mixed seafood pastas I have tried while in Italy! Although the dish was also delicious as is. Once we completed cooking the dish, we sat down and tried the dish with the prosecco. Again, we sat and talked about what we were tasting, how it paired, etc. I definitely spent more time just sitting and talking in this class than any other, but the conversation was so valuable (and I was taking notes!). Although the pasta and the prosecco paired pretty well, it didn’t pair quite as well as the prosciutto. Again, I would have never guessed that outcome before taking this class. 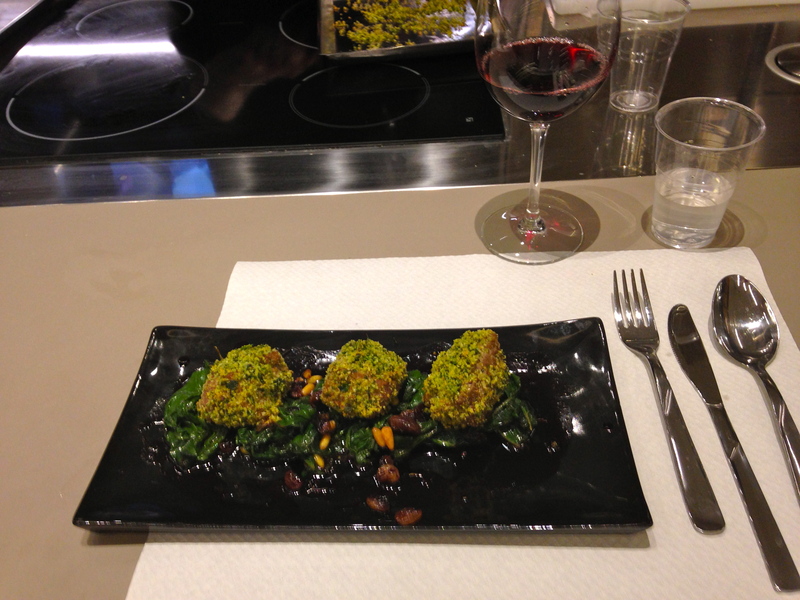 Next, we cooked a dish of beef medallions with an herb crust served over a bed of beet greens cooked with raisins and pine nuts. I’ve stated before that raisins and pine nuts are two ingredients I don’t really care for. Raisins specifically, I have never liked, even as a kid. MOM – I liked these raisins!! I didn’t just tolerate them in this dish, I LIKED them! I still didn’t care for the pine nuts, but I actually sought out the raisins as I ate the greens. They were very mild flavored, had been plumped in water before adding to the dish, and actually browned in the pan while we were cooking the greens. So this all transformed the taste of the raisins and they added a fantastic sweetness to the greens. The beef was incredible as well and the dish was dressed with a red wine reduction. We paired this dish with a Chianti Classico 2009 Reserve. Again, the strength of the aromas of the food and wine matched well. And the dryness of the wine balanced the richness of the beef and the greens. During the time I’ve been here, I thought I didn’t care much for Chianti because it is so dry. I now know it just needs to be paired with the right dish! To end the class, we tried a couple pairings with a dessert wine. The first was an Italian bleu cheese called maleghino. This pairing was INCREDIBLE. In fact, we had a bottle of dessert wine from Orvieto at home to drink before we left, so the day after taking this class I went to the market and bought maleghino to have at home. I’m not a big fan of bleu cheese. I don’t hate it; I can eat it. But I just don’t prefer it and will often avoid dishes containing any kind of bleu cheese or gorgonzola. I don’t know if that preference of mine will change overall, but I will likely crave this particular pairing. 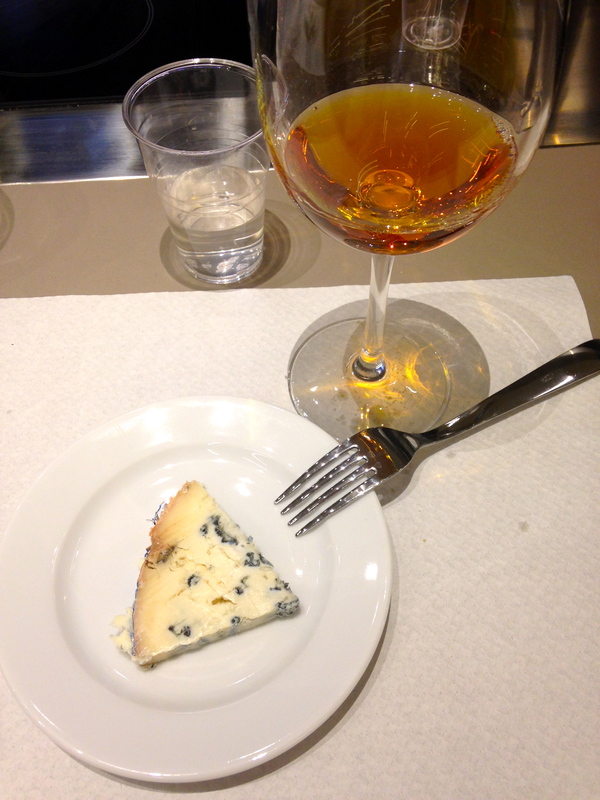 When pairing dessert wine, the rules change. Instead of offsetting richness with acidity, etc, you want to match sweet with sweet. The mold of the cheese was almost spicy, but the body of the cheese was sweet. When tasting the two together, they came together and created a new flavor that was greater than the sum of its parts. And that’s when you know you have found a fabulous pairing! 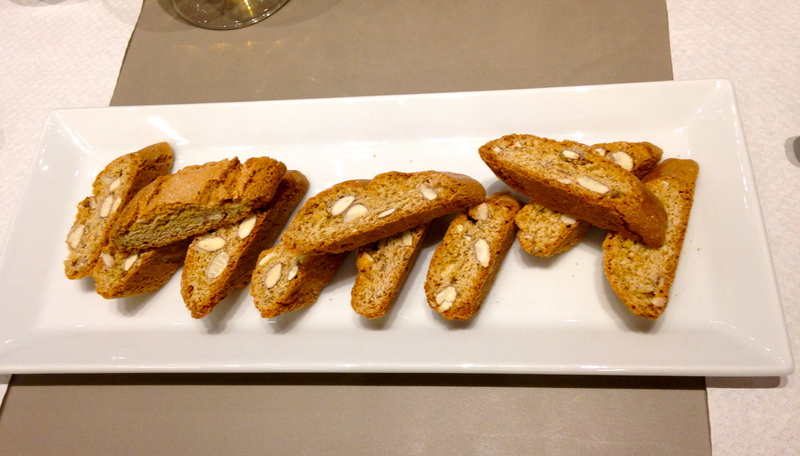 Lastly, we had some cantucci with the dessert wine. This is a classic pairing that we have had before in Italy. This was just as enjoyable, though not very notable after the incredible cheese pairing. 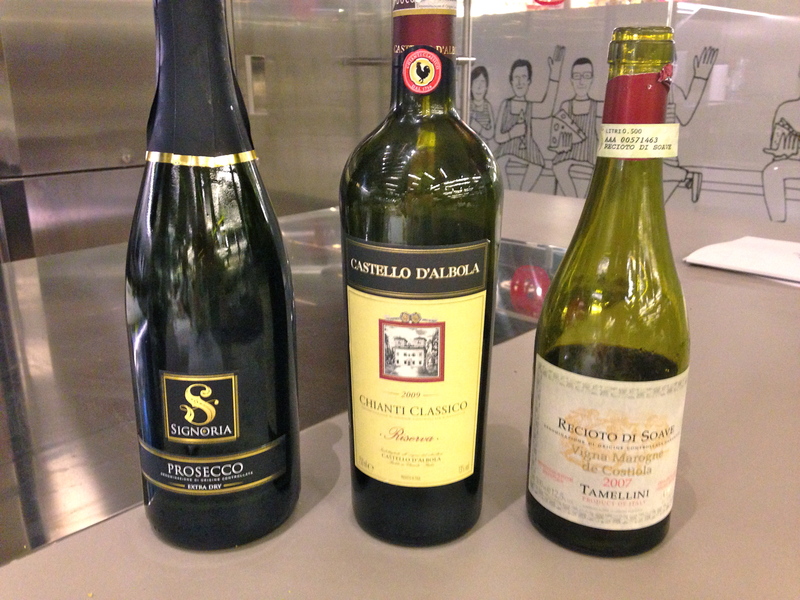 So I never forget the exact pairings, these are the three wines we tasted during this class. Overall, this class was fantastic and I really lucked out getting the individual attention of my own private lesson. It was an unforgettable experience! 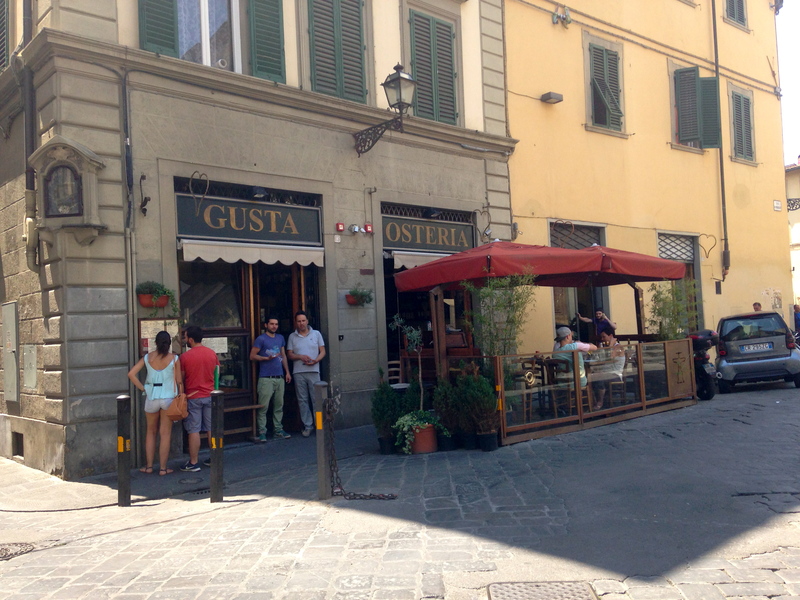 We had such great luck with the recommended restaurants near Santo Spirito (see Osteria Santo Spirito on days 41 & 71 and Trattoria Casalinga on day 44), we wanted to be sure to try the third restaurant that had been recommended in that area, Gusta Osteria. This restaurant was fantastic as well! 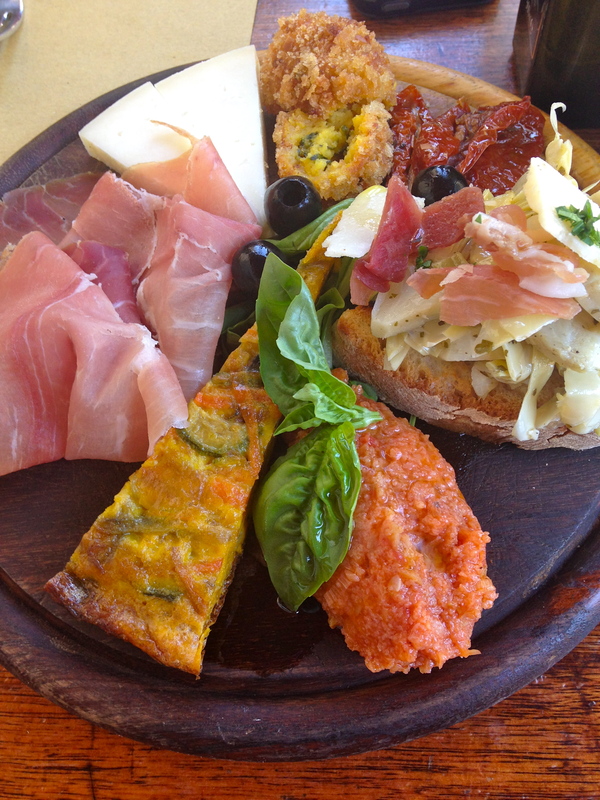 We started with the antipasto casereccio del Gusta, which means the homemade appetizers of Gusta Osteria. It was basically like an appetizer sampler, Italian style. On the plate we had prosciutto, pecorino, a fried ball of something (maybe an arancino? ), sun-dried tomatoes, an artichoke bruschetta, tomato and bread soup, and a zucchini and carrot frittata. 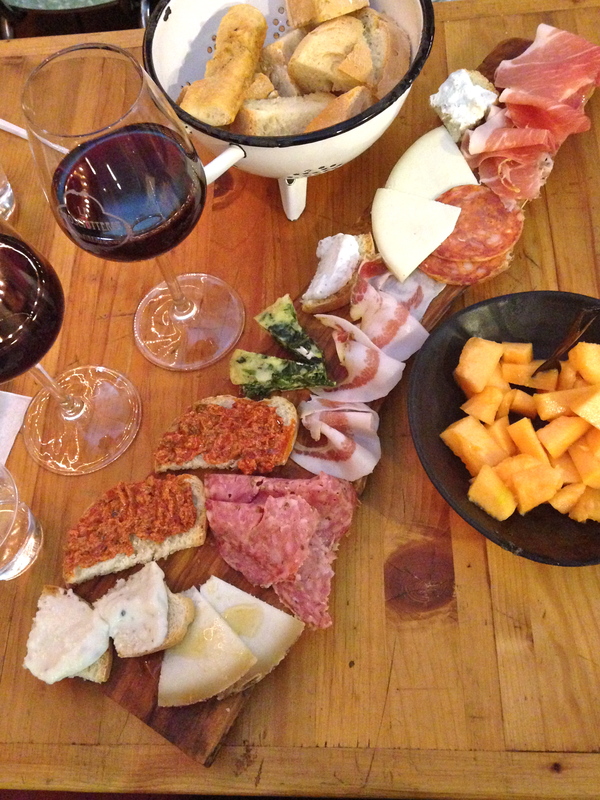 I’m so glad we had an antipasto platter like this again before we left! Everything on the plate was delicious. The frittata was served room temperature, which is common in Italy. And I’ve come to really enjoy them that way. 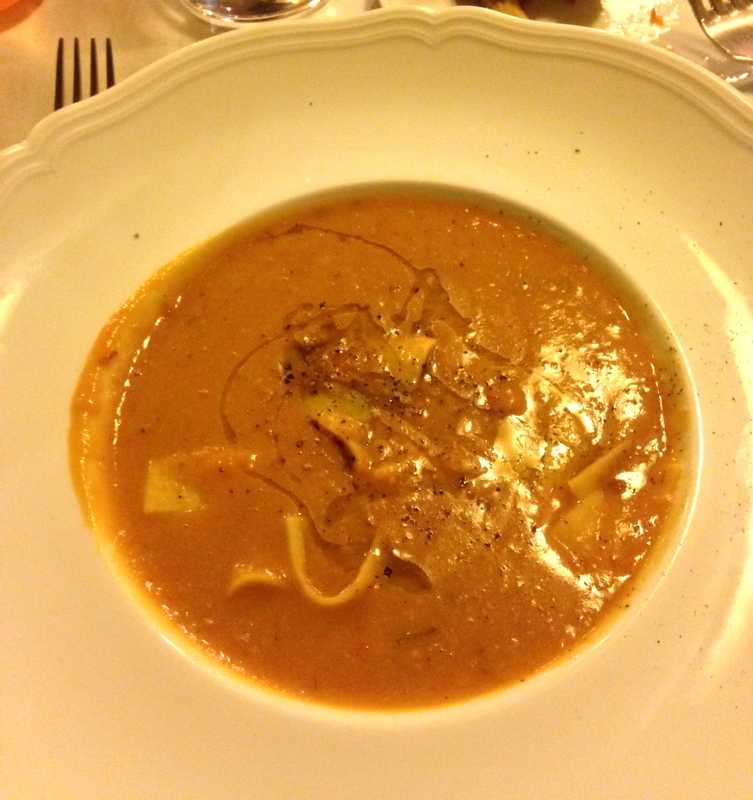 And the biggest revelation for me was the cold tomato and bread soup! It makes perfect sense. It is like a gazpacho made thick with the bread. It was very delicious served this way and since I love to make that soup, serving the leftovers cold makes it even easier! 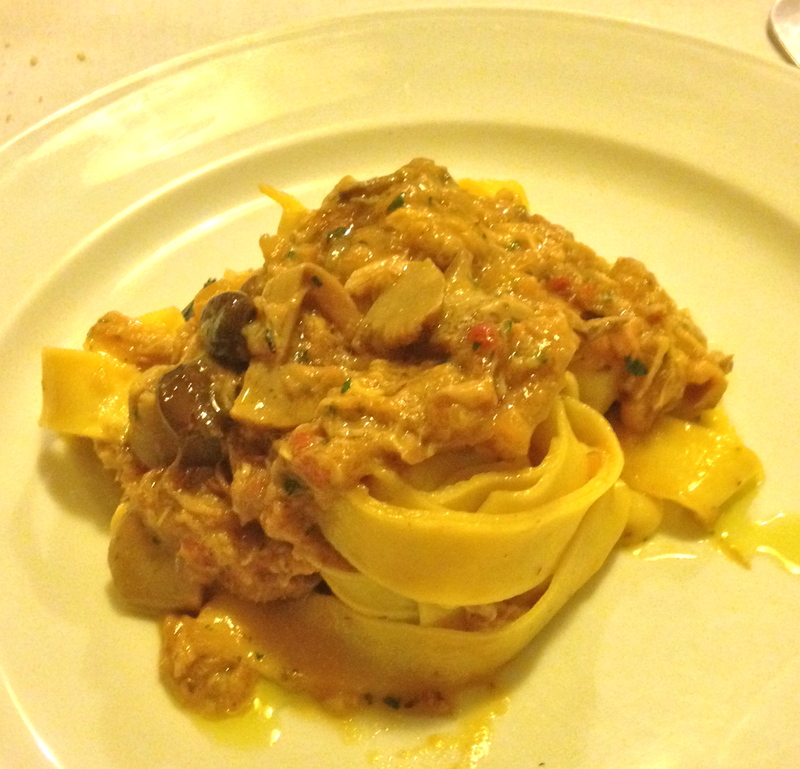 We then split a primi piatti, the spaghetti allo scoglio (spaghetti with seafood). Similar to what we had in Cinque Terre (see day 73), I think this will officially become one of my favorite dishes to have in the summer! Again, this was a mix of seafood tossed with spaghetti in a white wine sauce. 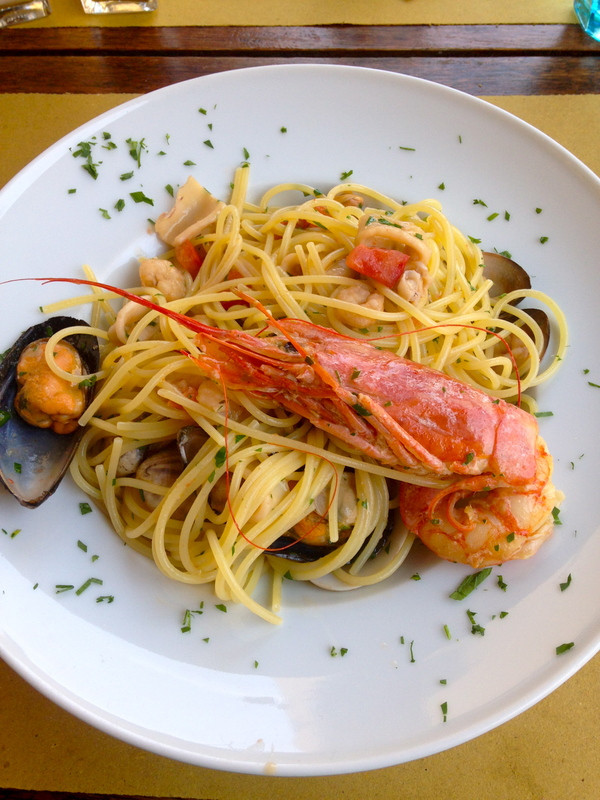 I’d have to say the dish we had in Cinque Terre was better, but part of that has to do with the hike we did there and being on the ocean, I’m sure. This was certainly delicious as well. 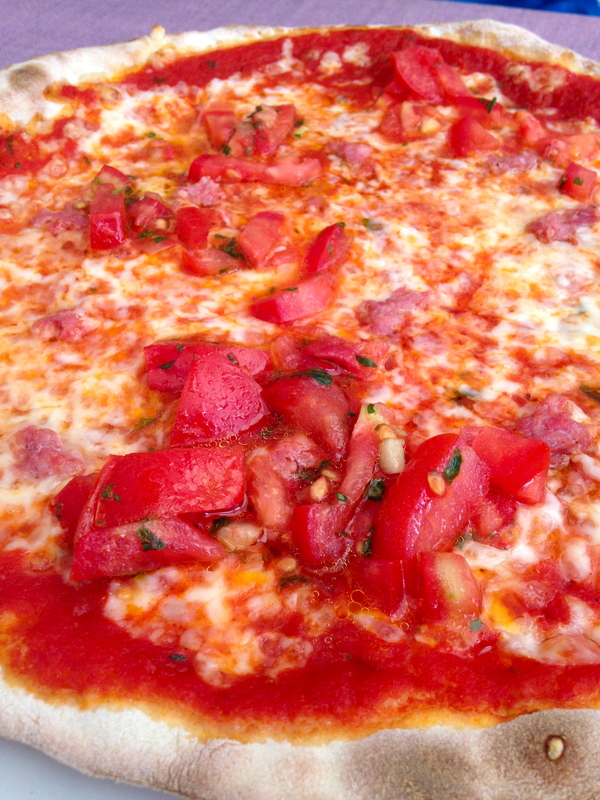 The last dish we split was probably not the wisest choice on another hot day, but it sounded good to us at the time. It was the polpettoncino del Gusta con patate arrosto, or meatball with roasted potatoes. 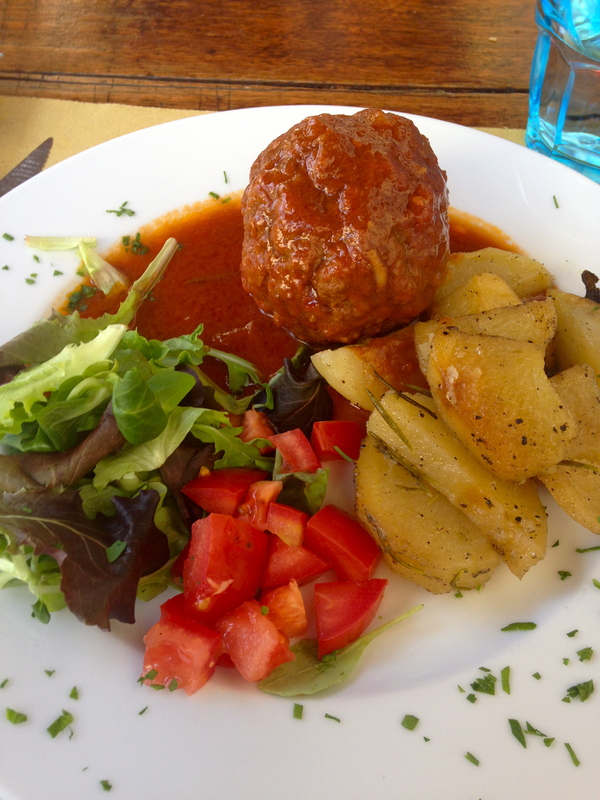 It was one huge meatball, served with roasted potatoes and a small lettuce and tomato salad. It was very good, although I would bet I would have been more impressed by it had it been cold outside. Nonetheless, we enjoyed this dish and the entire meal and getting back to one of our favorite piazzas before we head home!